Alright, we must have heard about ZUK Z2 which was officially launched in china recently set to go on sale on June 7. 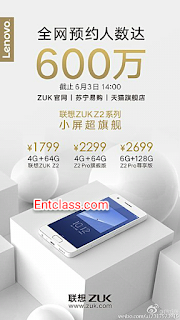 Which means, ZUK Z2 is now up for registration, surprisingly, the company has now brought out the total number of registrations which has crossed the 6 million mark. That's really impressive and remember that the number only represents those who have registered for the sale of ZUK Z2. The registration is not actually the pre-ordered of the smartphone, and also, the registration doesn't mean the number of the Sold device. Price range is about $275. I can see you didn't change it well cos i did it for a girl today and tutored one online last week.